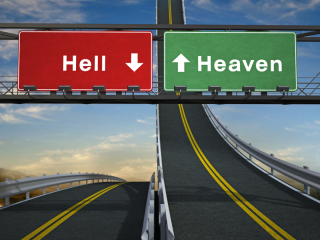 May 19, 2014 | EMM Main Blog | Kenny Luck	Which Sounds Better To You: Heaven or Hell? It may seem like a simple question to answer. Then again, culture seems to think hell will be a party for all eternity, while heaven will be a boring time playing harps, floating on clouds and living without any fun. Today’s culture doesn’t take heaven — or hell — seriously. But we should. In fact, the more you investigate both these eternal destinations, the more serious you will be about your decision to accept Jesus or not, and how you will live out your life on earth. But how often do you get together with friends to talk about what happens after death? Probably never. Couldn’t heaven and hell provide the ultimate motivation for life on earth? Yes. Key Point: The key to living a meaningful life is knowing the real truth about death. It’s like an eternal life insurance policy. The hope of eternal life in heaven can create a daily source of motivation to live differently; a life of love, grace and truth; a life that seeks to know, obey and serve God as our eternal father; a life that loves others. The alternative is to avoid God, ignore the reality of hell and live life assuming there are no consequences for your behavior. Others may choose not to believe in heaven or hell and just try to be “good people” for the sake of being good contributors to society. But both of these decisions have dire consequences. Key Point: A decision to live separate from God in this life is a decision to live separate from God in the next. Jesus called heaven, in Luke 23:43, “paradise.” And hell, on the other hand, is the exact opposite. The Bible says hell is a place of never-ending physical torment, torture and anguish. So how can you be sure you won’t spend eternity in hell? What crime does a person have to commit to be sent to such a horrible place? The answer is: Rejecting Jesus as the Son of God, the Savior. God does not send people to hell. We do that to ourselves because of our choice to accept or reject Jesus for who He said He is. Between heaven and hell is Jesus. This is one decision not to leave to a coin toss. Don’t reject his personal offer, personal sacrifice, and personal love for you – honor it and say “Yes” to Jesus. Start your eternity now. Right now I want to personally recognize what you did for me so that a way to heaven could be possible. Thank you for dying for my sins. I say “yes” to you and to forgiveness. I give you all that I am, all that I have, and all that I hope to be. I release myself to your purposes. Take control of my life and help me to always remember your sacrifice. Make me the man you created me to be now and forever. Amen. If you have started a relationship with Jesus today, it’s time to get to know your Savior and start spending time with him. To do this simply click here and enter the coupon code newbeliever and get the Face Time 4 Part Series for FREE. This series will show you how God wants a personal relationship with YOU!